The Alaska Railroad corridor lies between the mountains of the spectacular Alaska and Talkeetna ranges. Your journey traverses sparkling rivers and the legendary Matanuska Valley. Arrive in Denali National Park with an afternoon free for a wide range of optional Alaska tour activities — sightsee via helicopter, airplane, dog cart, ATV or river raft. For an entertaining evening, catch the frontier spirit at an optional dinner theater excursion. Overnight Denali-area hotel. 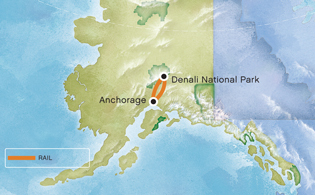 Enjoy a morning at leisure or journey into Denali National Park on an optional Natural History Tour of the Park. Later, re-board a luxury railcar for the return journey to Anchorage. Watch for Mt. McKinley and other landmark sights. Then hold your breath as you cross the 296-foot-high Hurricane Gulch railroad trestle constructed in 1921 using a tramway strung across the gulch. Your vacation in Alaska comes to a close at the railroad depot in Anchorage.